This is the scariest freaking business I’ve read in a long time: Christopher Soghoian, a computer science student who had created an online generator for fake boarding passes–solely to point out how ludicrously ineffective airport security is–has been visited several times by the FBI, most recently, with a 2am warrant that allowed the Bureau to seize every single piece of tech in the student’s home. (See a scan of the warrant at BoingBoing). The kid (he’s 24 years old) is simply highlighting that TSA airport security is “security theater”–providing the illusion of security while actually not protecting anything or anyone. Anybody can print their own online boarding pass and use it to get past gate security (as Andy Bowers illustrated in Slate nearly two years ago); and anyone can easily use two boarding passes to not only get past security, but to board the plane under a false ID. What’s most amazing is that Soghoian is simply revealing flaws in a system that desperately needs fixing. But the federal government is treating him as a terrorist. Who’s to say that millions haven’t already printed their own fake boarding passes and done what Soghian is only suggesting? Who’s to say that I, who travel every week from Charlotte to Dulles International Airport, haven’t used Photoshop to doctor an online boarding pass copied from usairways.com to get through security? It’s simple, and any idiot can do it. You take a screenshot of your real boarding pass (right before you print it) (and most airlines allow you to “check in” online, meaning you can call up your boarding pass right in your web browser). And then you edit that screenshot in Photoshop. Substitute your seat assignment, your flight number, whatever. As long as it looks vaguely like US Airways real online boarding pass, you can get right through security. Even though I was a paying customer and had a real boarding pass, I generated a separate fake one. I forged one. Just to test the system. I boarded and flew and landed home. Now I’m worried. Is the FBI going to come after me? 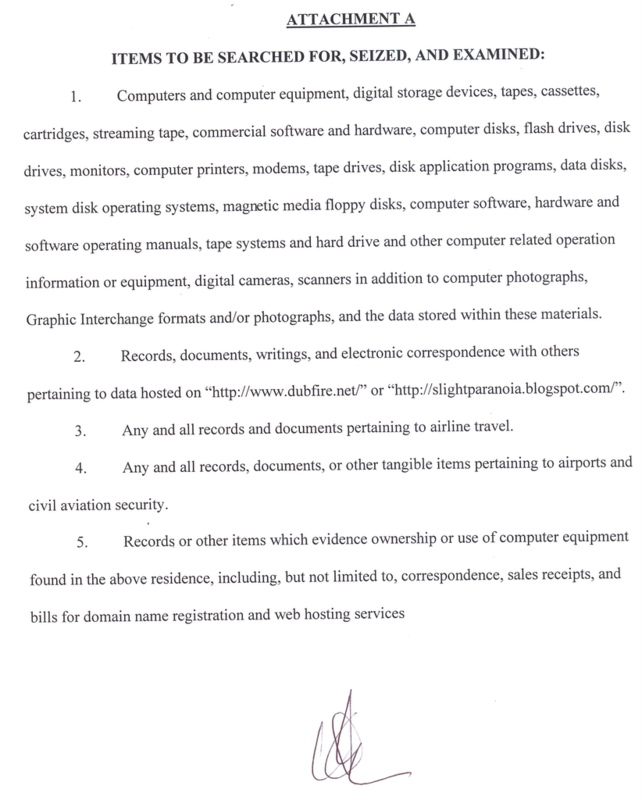 Seize my computers and flash drives and scanners and printers? I did what the terrorists could do. Does that make me an enemy of the state? I broke federal law (DHS Code Title 49, Volume 8; October 1, 2004 rev. [Page 302]. I knowingly lied to a federal official. Security fraud. I committed it. What if I didn’t print a fake boarding pass. What if I only thought about it. What if I’m lying right now. Who’s to say that I haven’t printed fake boarding passes. Who’s to say that I have. I did this and you should too. The big surprise in today’s USA Today story about the NSA building a staggering database of every single domestic phone call in the United States is not that such a database exists, but that the NSA waited until after 9/11 to begin building it. I think we had always assumed that the government was already gathering this information, logging every phone call, timestamping every caller and every recipient, and crossreferencing all those records. Think of it: every pizza delivery order in the U.S. stored for posterity’s sake. Oh, the marketing possibilities! “A database of every phone call ever made”: this is how one insider describes it. I caught snippets of the Diane Rehm Show today, and there was a panel of experts discussing the domestic war on terror. There’s the predictable apologist for the Bush administration, spouting the standard refrain that because there’s been no terror attack on the U.S. since 9/11, all that illegal wiretapping and surveillance and profiling and warmongering has paid off. Okay, fine, that’s no surprise, what he’s saying. Typical specious reasoning, Homer Simpson style. But what got me was one of the callers. First, he said that Robert Heinlein is one of his favorite authors. Red flags go off, right there alone. Then the guy, a marine who, to his credit, is on his way to Afghanistan, says that Heinlein has a quote, something like, You can have peace and you can have freedom, but you can’t have peace and freedom. If I’m not mistaken, that’s Starship Troopers talking, Heinlein’s most (and there are many contenders) fascistic novel, where his militaristic, kill the motherfragging aliens, and so what if a few humans die, because they were weak and deserved to die urges come to full blossom. And this guy is citing it as a textbook for American liberty? I bow before the almighty forces of juvenile literature! What I want to write is so confidential, so classified, I can’t even write it. It has something to do with the Pentagon the government. That’s about all I can say. And that people involved have signed non-disclosure agreements. Which have been broken. Apparently. Maybe not. I don’t know. The lawyers are deciding. The key word, though, is threat analysis shambles. I know what “synchronizing” means, I guess, but what does that slogan mean? Why does the world of commerce need to be synchronized? Is it out-of-synch? I suddenly began thinking of all the ways we know use the word “synchronize”—we do it with our Palms and Pocket PCs, our email accounts, our files, anything where we have multiple copies of something and one is more recent than the others. (Ignore for the moment the out-of-date and oh-so-nineties N-Sync.) Synchronicity here deals with time. Something that has been synchronized is now closer to the present (and thereby, on the near edge of the future) than something that has not been synchronized. With the UPS slogan, however, a new dimension has been added to the essence of “synchronize.” That dimension is the dimension of space, for that is what UPS is known for: moving objects through physical space. UPS’s new slogan extends UPS’s dominance to the dimension of time. “Synchronicity” is a marriage of time and space, or really, the fantasy of enfolded space. A sort of time warp, where information travels instantly because space is folded on itself. What we have here is the dream of instantaneous information (made possible by UPS’s pioneering infrastructure). I find this vision very close the the fantasy of total complete information. The new media theorist Stuart Moulthrop has written about the “game of perfect information“—that if we possess enough computing power and access to the best available data, we can make perfect decisions. Moulthrop was talking about this way back in the nineties, and he was eerily prescient of the Defense Department’s failed Total Information Awareness Project. The UPS slogan articulates the same cultural tendencies that led Admiral Poindexter, the “visionary” behind the Total Information Awareness program, to pursue a means to “imagine, develop, apply, integrate, demonstrate and transition information technologies, components and prototype, closed-loop, information systems.” This mission statement is so vague (not to mention grammatically difficult to parse) that it could apply to a corporation’s strategy for dominance in global commerce as well as to a nation’s “war” against terrorism. Last week the New York Times did a story on Russ Kick’s site, the Memory Hole, and it’s been quite revealing to go through the documents on his site. Kinda like the Smoking Gun, but it’s about the banal conspiracies of everyday bureaucrats instead of the dirty laundry of celebrities. I’m about to do one of the things he suggests–request a video from the Secret Service–using the Freedom of Information Act. Sure beats Blockbuster.